As far as comfort foods go, soup wins it for me every time. No matter what the occasion, there is never a time when sitting down with a big bowl of soup wouldn’t make me feel instantly better. Growing up in my family, sick days meant soup days from the nearest Chinese restaurant. Usually it was wonton or egg drop – whatever the special may have been at the time – and always finished off with a generous helping of fried rice. If that’s not enough to make you feel better then I don’t know what would. So last week when Mike came down with a nasty virus, soup was my first instinct. My usual go to these days when one of us is sick is egg drop soup. It’s a simple enough soup that even Mike can put together whenever I’m feeling under the weather. That may not sound like much of a feat, but standing upright long enough to finish a dish is a big deal for anyone with POTS. If there is one problem with egg drop soup it’s that it’s more of a starter/appetizer to a larger meal. While I’m quite content having a light dinner of what is essentially broth every now and then, Mike of course is a man which means he’s never full. Growing up with four brothers I’m very aware of the fact that boys have what feels like bottomless pits for stomaches. If there’s no meat involved in a meal then it’s merely a snack and snacks to don’t satiate you they just pass the time until your next meal. By the way your next meal is never soon enough. Going back to this soup, it was Mike who had the stroke of genius to add the meatballs to our usual egg drop. Earlier in the day I had been filming a video to go along with these Thai meatballs. Since posting it last year, it’s hands down the most popular recipe on my blog. I wanted to go back and add a video to go along with the recipe to enhance the post & get in a little more practice with the video making. The meatballs were just sitting on the counter begging to be added to a meatball and egg drop soup. Perfect for adding to soup. Perfect for bulking out a meal enough to feed and satisfy my bottomless pit of a husband. The base of the soup is similar to that of your average egg drop: broth, spring onions, a touch of ginger, eggs. 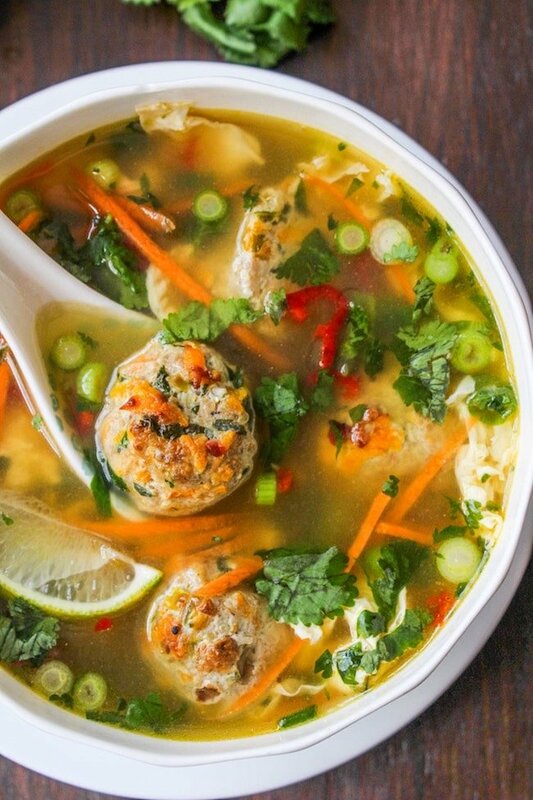 Since we’re adding Thai inspired meatballs to this version I spruced up the broth with more typical Thai flavors: chilis, fish sauce, a squeeze of lime juice, and heaps more cilantro and spring onions. If there is one food rule in our house it’s to alway add another handful of both cilantro and spring onions to whatever you’re eating. While the meatballs are baking, take that time to prep your soup. Slice the carrots into matchsticks, chop up the cilantro, deseed the chilies, and wash your spring onions. Get it all ready to add to your broth when the time comes. After the meatballs finish baking (about 25 minutes or so) begin making the soup. This part should take about 10 minutes tops. After you add the eggs to the soup you can finally add the meatballs. Taste your soup. Add a little more salt/pepper/ whatever you’d like and then serve. This meatball and egg drop soup was good the first day, I went straight back the store the next morning to get more turkey to make it again. It’s nice to have a little something to look forward to on sick days. The whole sick part’s no good, but at least the food is nice. 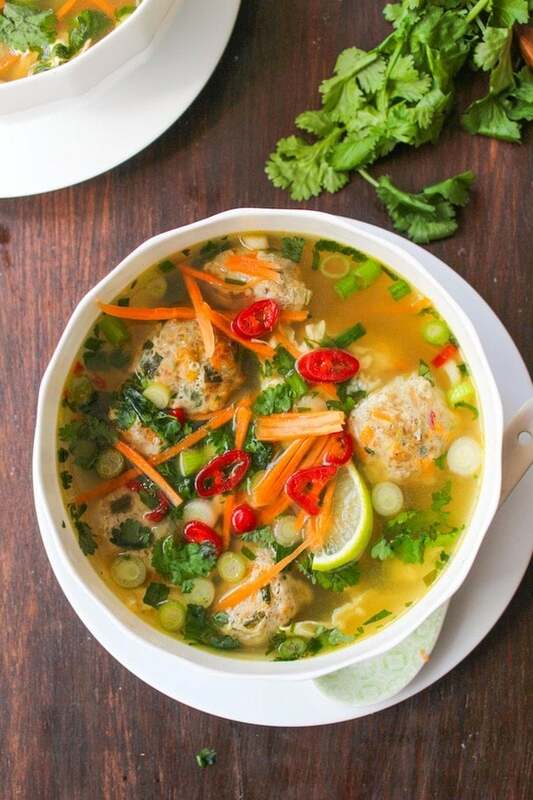 Don’t forget to #asaucykitchen on instagram if you try this Thai Meatball and Egg Drop Soup. We love to see what you make with it! You can also post your pictures to my facebook page! In a bowl combine all of your meatball ingredients. Mix well and form into balls. If the mixture is a bit wet and sticks, wet your hand with a little water and then roll the balls. Place balls on lined baking sheet and bake for 20-25 minutes. In a large pot, warm the sesame oil on a medium heat. Add the minced ginger and chopped chilis to the oil and gently sauté for 1-2 minutes. Add the stock, water, coconut aminos, fish sauce, and lime juice to the pot and turn up the heat to medium high. While the broth is heating up, whisk your eggs. Once the broth begins to boil, slowly drizzle the eggs into the soup. Use a fork to stir the eggs to create ribbons and prevent clumping. Reduce the heat and then add the spring onions, carrot, and cilantro and let the soup cook an extra minute. Carefully drop the meatballs into the broth. Taste the soup and season with salt and pepper to your own preference. Top with more spring onions, cilantro, and/or chili if you'd like and serve. Feel free to use different types of chilies here based on your preference for spice. We use red anaheim chilies which tend to be more on the mild side. If you like things with more spice you can also use red or green jalapeños - red will be spicier than green. Very delicious the family loved it! Glad you guys liked it! Thanks for coming back to let me know what you thought! This was amazing, I found thai chilis in the grocery store and used those instead because we love spicy. My husband and I love it so much I made it twice last week and plan to make it again tomorrow. Thanks for the awesome recipe! Yay! Thanks Kayla – so glad you guys enjoyed it! Absolutely delicious, this will become one of our staples. Hi Natale! I’m so happy to hear that – really glad you like it! That’s a good point about the extra moisture too! I just made a note in the recipe to squeeze out the extra water. Thanks for pointing that out to me! This recipe looks amazing, can’t wait to try it. I’ve never used fish sauce before. Is it an important element in the recipe? Is it high in sodium? 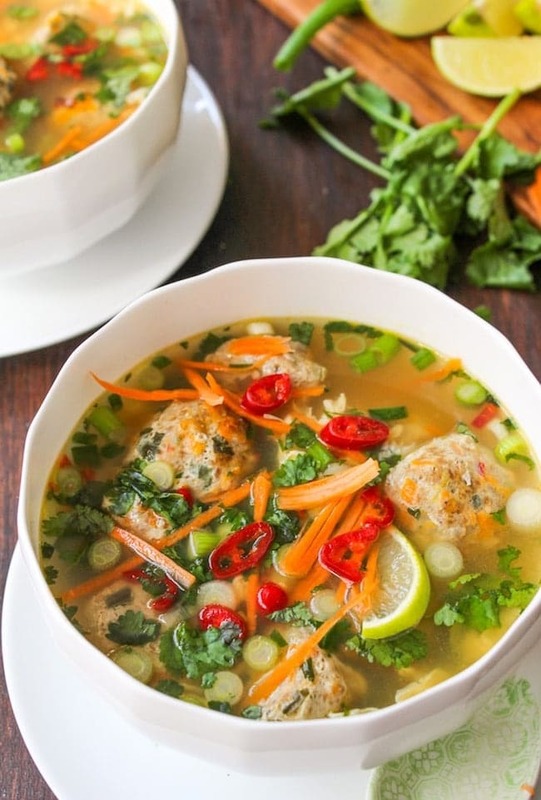 Has anyone cooked the meatballs in the broth instead of baking them separately? This was REALLY good. I am always skeptical of recipes online that claim to be thai-inspired, as they usually lack flavour and spice. This soup was a home run for my husband and I. I followed the recipe step by step and it was a breeze. Thanks for the new weeknight staple! Thanks Tess – so glad to hear that you guys liked it! Thanks so much for coming back and letting me know what you thought! Made this tonight for me and my husband. It came together pretty easily, especially since I had made the meatballs a couple days before. We both really liked this soup! (I am the one with stomach issues, so it’s great to find a recipe that hubby simply enjoys because it’s GOOD.) I’ll definitely be making it again (and again!). I added some bell peppers and spinach for more veggies It looks so nice with the ribbons of egg. Thanks for the recipe! So glad to hear that you both enjoyed it! Thanks so much for coming back to leave a review – I really love hearing how it went! Thanks for the soup inspiration! On our third Whole30 and was feeling food boredom so googled around. I used pork for the meatballs, added coriander since I was fresh out of cilantro, and added zoodles and steamed broccoli to get in more veggies. Really good! Ooh yay! SO glad you enjoyed it! Since you’re in your third round you probably don’t need it but good luck on the rest of your Whole30! I was so excited to make this recipe. It sounded wonderful in every way. I started by grinding my own organic chicken breast with my kitchen aid meat grinder. I used the large grind format. The meat mixture was very wet once mixed with the other ingredients but I did get the meatballs formed. I baked them per the recipe. They seemed cooked through but the texture was mushy and seemed to make the taste even undesirable. I’m super disappointed. I tried baking them longer but it didn’t improve the texture. I’m wondering if all those who raved about the recipe made the meatballs. I’d love some feedback. Mine went down the garbage disposal. Hi Cheryl! Sorry to hear that! I’m not sure what went wrong here. It sounds like the meatballs ended up with too much moisture and needed something like a breadcrumb to soak up some of the excess liquid here. Unfortunately, I’ve never tried grinding my own meat so I don’t know if/how that might affect the final result. Almond flour is a great low carb binder for meatballs that is what I used and they were tasty. Wondering what you are supposed to let the soup do though? Oops! My mistake! I recently went and fixed a small typo there and ended up with another typo! Thanks for pointing that out to me! It’s supposed to say ‘let the soup cook another minute’. This soup is packed with flavor. My kids ask for it all the time. That’s awesome! Thanks so much for coming back to leave a review letting me know what you guys think! This soup is delicious! Love Thai food, introducing my husband to these flavors! So glad you enjoyed it! Also glad you were able to share it with your husband – I’m always happy when I’m able to get my husband to try new things too 🙂 Thanks for coming back to leave a comment/rating letting me know how it went! Is this soup suitable to freeze? Is this soup taste okay reheated?? Does the egg stay a good consistency after its refrigerated and reheated? Yep! I make egg drop soup all the time & never have any problems with the eggs. Hope you like it! This soup was so delicious! My entire family loved it, my kids all ate 2 big bowls! Thank you for a recipe that will definitely be added to our regular rotation! Trying this out tonight! Did you use Thai red chiles or normal red chiles?? Just normal red chilies that I was able to find at the grocery store. Hope you liked it! I’ve always been wary of egg drop soups. How long do you have to keep the egg in there before it cooks? If the broth is boiling when you mix it in it cooks pretty much instantly – you’ll be able to tell by the way the egg puffs out and turns a light golden color. Hope that helps! I tweaked it a bit but not to much as I do with everything I make. The broth was super silky. This is a nice high protien soup which I am always on the hunt for. I wouldn’t be my mothers daughter if I didn’t tweak every recipe I find 🙂 Glad you liked it! Thanks for coming back to leave a comment! I added a little shredded coconut and almond flour to the meatballs which I think worked well. Ooh, I love that idea! So glad you liked it! I cannot wait to try this! 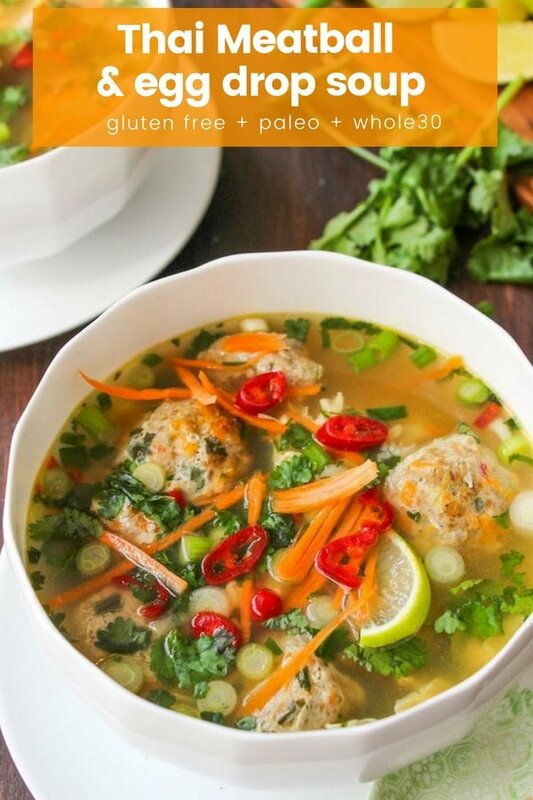 My husband and I love Thai food and this soup looks AMAZING!